Robby’s 2012 JK has just been upgraded. This is the first 2012 I’ve driven and what a difference the new 3.6L makes. The new 5speed transmission seems to shift nicely as well. This JK was set up for daily commutes as well as weekend exploration. The 4dr was lifted 2.5″ with Teraflex’s budget kit with shock extensions. 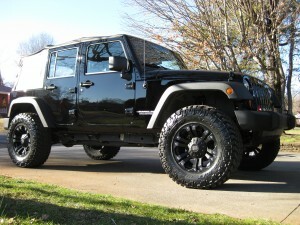 We used AEV’s newest wheel, 17″ Pintlers in black. Robby chose to leave off the coveted yellow center caps to keep things clean. Tires used in the build are 295/70r17 Nitto Terra Grapplers. A 5th tire/wheel was installed as well in case of emergency. The Jeep drives great. We’ll update as the build continues. Probably one of the best build platforms out there is the 03-06 Jeep TJ Rubicon. They come out of the box with a good wheelbase, 4:1 transfer case, locking differentials, and aggressive tires. This TJ was purchased used last year by the customer. Unfortunately, the previous owner had replaced the Goodyear MTR tires with a highway tread tire. It wasn’t all bad , though. The Jeep had a 1.75″ budget boost already. The purchase was followed soon with a Warn winch mounting plate and a Warn M8000 winch. We began making a list of mods that the customer would be interested in. We started the upgrades and what resulted was a well rounded, capable, daily driven machine. This is a 2011 Jeep Wrangler Unlimited. It was in the shop here last month for some much needed upgrades. The JK was originally equipped with a 28″ tire and going off road the low hanging undercarraige was vulnerable and begging for some rock rash. Being a daily driver and weekend wheeler, David wanted combination of parts that would still improve the off road capability, yet turn some heads when driving around town. Here are the upgrades: Teraflex 2.5″ spacer lift with 9550 shocks, 295/70r18 Nitto Trail Grapplers, 18×9 KMC Monster wheels, AEV Procal calibration module. David also opted for the matching spare tire so that it would look right hanging on the rear and operate correctly in case he damaged one. Stay tuned as David returns for future upgrades.